DO NOT be put off from making apple pie out of fear of a bad crust. While it takes some practice to make a truly great crust, chances are your audience for fresh apple pie will be forgiving of your early efforts to master the art, even if just as a flavorful way to hold the filling. Like most things, pastry making gets better with experience, so forge on! Here are two different styles of pie crust. “Dense and Delicious Whole Wheat Oil Pastry Crust” is healthier but harder to roll out than “Rich Pie Crust,” which is why wax paper is recommended. Measure dry ingredients into a bowl. Combine oil and water/milk in a small bowl and pour all at once into the flour. Mix the dough, divide it in half, wrap two flattened balls in plastic wrap, then chill for about 10 minutes. Roll out either on a floured surface or between waxed paper. Many people consider Macoun the best fresh-eating apple, but it is also outstanding in pies. Macouns are esteemed by apple connoisseurs for their crispy, juicy flesh and rich, complex flavors that hint of strawberry and spices. Macouns do not store well compared to many varieties, making them in great demand during harvest in mid-September. 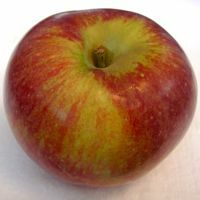 Named after a Canadian pomologist, this variety is pronounced as if spelled “MacCowan.” It was developed in Canada in the early 1900s, the offspring of McIntosh and Jersey Black, an American heirloom apple once known as Black Apple due to its dark color. Another popular choice for pies is the heirloom variety Northern Spy, a larger than average apple with a deep red skin with red striping. It has a strong, sweet flavor and crisp texture. Northern Spy are good for fresh eating, drying, and juice, as well as in pies. The first seed of Northern Spy came from Salisbury, Connecticut around 1800, and it was first grown by H. Chapin of East Bloomfield, New York. Introduced commercially in 1840, it quickly became a success, especially in the Northeast and Canada. 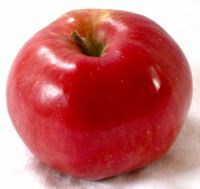 It is a mid-season apple; harvest typically begins in late September or early October.